This towelling doll hoodie (shown here on a Lottie doll) is made from bits of the baby washcloth set of 5 we purchased for $2 in a dollar store. We used just over half of one for the doll hoodie for this size of a doll, making the cost of materials under 50 cents. With the remains of the set, we'll be able to make a pair of shorts and a few tops easily. The same fabric was used to make a hooded towel for a baby doll as the fine loops and small patterns make it in scale for small-scale dolls, as well as having the correct drape to fit their bodies. These towels/​facecloths usually are found in the baby section and come in coordinated colors and patterns that work well for a range of doll clothes. Other suitable fabrics include pieces of fine knits from baby clothes, (like the one used to make leggings for dolls) or knits from the bargain underwear section. The doll shown here is roughly 7 1/2 inches (18cm) tall. How Much Fabric Do You Need for a Doll Hoodie? To work out the amount of fabric you need to make a towelling hoodie for a doll, lay the doll on a flat surface with arms extended to the sides. Fold a piece of fabric in half so it reaches from just above the doll's shoulders, to 1/4 inch below where you want the hoodie bottom to be. If the doll's arms are down at her sides, you usually want a length that reaches the doll's wrists or fingertips. We chose to use a stripe pattern for our hoodie and picked a dark pink co-ordinate to make the hood lining and the pocket to add a bit of interest. Normally we would choose fabric to stretch across the body of the doll, but in this case, the pattern dictated the fabric layout. For larger dolls, it is advisable to set the stretch of the fabric across the body of the doll. In addition to the main fabric length, you will need two strips of fabric long enough and wide enough to make a hood (one for the outer hood one for the liner) and a piece of fabric for the pocket with a similar sized piece for the neck facing. The layout and shape of these pieces are described later in this sxs tutorial. If you are working with a larger doll, you may want to use a tape measure or a piece of paper to work out the size of your main fabric piece (the folded section without shaping). Once you know how much fabric you will need for the main section and the hood, you can look for a lightweight towel in the dollar store to act as a fabric, or choose yardage from a fabric store. Once you have a rectangle of fabric sized to fit across your doll's arms (we included enough to go beyond her hands, you can always trim it back), you can fit the fabric over the doll and trim it for the arms and body. To fit the fabric over the doll, fold it in half, lengthwise, then widthwise to find the center of the fabric. Cut a narrow slit across the center lengthwise, keeping the slit to slightly less width than the doll's head. Now cut a slit from the center of that cut down the center fold of the fabric (at right angles to your first cut) to shape a short "T" (see the next page for a photo). Carefully test the fit over the head of your doll to make sure you can get the neck opening over the doll's head. If your doll has a large head, or your first cuts won't fit the fabric over the doll's head cut the base of the "T" (the slit that will be down the center front) longer. Once you have the fabric over the doll's head, pin the square edges together so they won't slip on you, and cut the 'square' out of the corners of the folded fabric so you have an arm and a front as shown on the right side of the photo. Make sure you leave at least 1/4 inch (.6cm) extra fabric on all cut edges to give you a seam allowance. If your doll has large hands, you may need to make the sleeves wider so the hands can be slipped through easily. 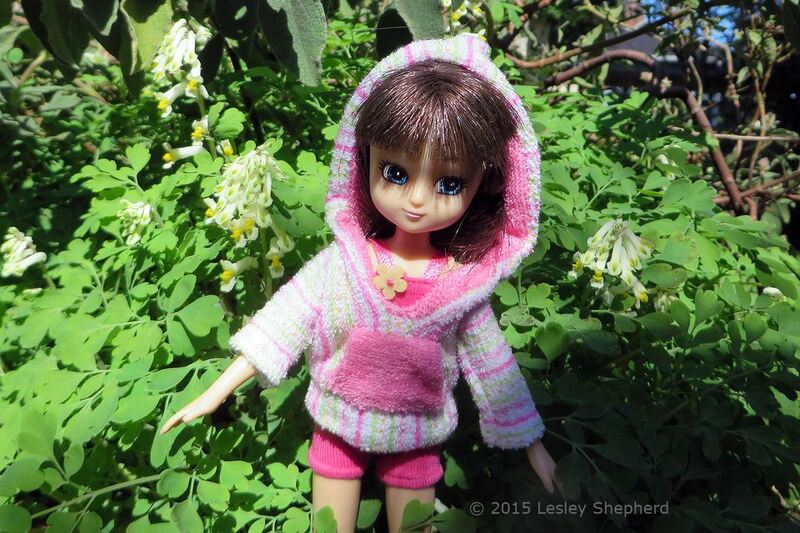 If your doll has a very large head, it may be easier to make the hoodie open completely down the front, rather than making it a "pull over", or you may need to make the front slit longer and add a tie or a button to close it. The photo on this page shows the folded fabric for the doll hoodie in the insert with the position of the cut on the fold. When the fabric has been cut away from the corners, you should have a piece similar to the one shown with the yellow lines showing the cut for the neck (across the center of the arms) and the cut for the front opening centered on the base of the neck cut. Don't cut the neck opening too wide, or it will slip off the doll's shoulders. If you need extra space for the head opening, cut a longer base for the "T" to open the hoodie up more at the front. With your main pattern piece cut, take a small rectangle of paper and size it to make a pocket for the front of your hoodie. The folded lines at the top and bottom represent the seam stitching lines for the pocket. Make sure your doll's hand can fit into the pocket between the seam lines. The rectangle is folded and trimmed slightly with a curve on the sides to make the characteristic "kangaroo" pocket for a hoody which is narrower at the top and curves to the bottom. The pattern piece allows for extra fabric on the sides as well as the top and bottom so you can stitch the seams and edges. To locate the pocket section of the front of the hoodie, you may need to test the pattern against the main fabric section while it is sitting on the doll's body. That will give you an idea of whether the pocket pattern is the correct size to fit on the front of the hoodie after the hoodie is hemmed and has the neck facing sewn in. (see next steps). Once you have your pocket pattern (previous step) turn the side edges over and sew a simple rolled hem to finish the side edges (see insert). Test fit the pocket on the hoodie while the main fabric is on the doll. Pin it into place. Remove the fabric from the doll and open it up. You can use a sewing machine to sew the top and bottom of the pocket on the hoodie, or you can use a simple hand sewing backstitch. To hide the stitching if you don't want to make it a feature, lay the pocket right side down on the main fabric with the seam of the pocket top on the line you want to sew it to. The pocket will be laying over the neck opening. Stitch along your top pocket seamline taking care to make sure the seamline is straight across the body of the hoodie. When you have finished the top seam, turn the pocket so it is in the correct position and hand stitch the bottom folded edge in place using a blind hemming stitch. Take care not to stretch the pocket as you sew it in place or you may pucker the front of your hoodie. With the pocket in place, the next step in assembling a hoodie for a doll is to make a front facing to finish the front opening edge. A small rectangle of fabric slightly longer and wider than the "T" opening cut for the neck edge is laid over the neck edge so the right sides are together as shown in the main photograph. Pin the facing into place. Flip the fabric over (as shown in the inset photo) and stitch a backstitch (or a machine stitch) down both sides of the front opening and around the end as shown. The stitches should be close to the cut edges of the front opening, roughly 1/8 inch (3mm) in from the cut edges. Only sew the base of the "T", the front opening, to the front facing rectangle. Leave the neck edges free. See the next step for the finished facing. To finish the front facing, while the main fabric piece is facing up where you can see the opening edges, use sharp scissors to cut a slit in the facing to match the slit in the main hoodie section. Turn the fabric facing to the inside of the hoodie as shown in the main photo. On the wrong side (inside) of the hoodie fabric, the facing will look like the inset photo. The shape and size of the hood for a doll hoodie will depend on the size of the doll's head and the arrangement of its hair. Use a strip of paper to size the piece of fabric you will need for the hood. The paper should stretch over the doll's head (and hairdo) down to the doll's shoulders with a bit extra (1/4 inch or 6mm on either end) for the seams. The strip of paper should be wide enough to overlap at the back of the doll's head and leave at least 1/4 inch (6mm) for the seam at the front of the hood, which will be lined to finish the seams. Once you have a strip of paper the correct length and width, cut a strip of fabric to match for the lining of the doll hood. Fold the fabric in the center to make the top of the hood, and stitch a curved line back and a curved line towards the base at the opening for the neck edge as you see on the pink lining shown. The curve of the hood will depend a lot of the shape of the doll's head and its hairstyle. You can sketch it out roughly on your paper pattern before you stitch it. Test fit the stitched hood (with the seams out) on the doll's head before you trim it to shape on the corners. Adjust your sewing if necessary after you test fit it to the doll. Only trim the seams once you are sure the inner lining fits the head of your doll. With the hoodie lining test fitted, cut a matching piece for your outer fabric. The outer hood section should be larger on the front edge so that when sewn, the main fabric will make a band along the interior of the hood. This will give you a channel for a pull cord if you wish. The outer fabric will also need to be cut slightly larger to allow for the thickness of the inner liner. Notice in the photo how there is roughly 1/4 inch (6mm) of extra fabric on the front, back and lower edges of the main hood (striped section. With the main fabric piece laid out flat, test fit the neck edge of your hood liner to the neck opening of your doll hoodie, after you have tested the fit on the doll. The liner should fit across the back of the neck opening then the hood edges should fold so the rest of the hood can be stitched across the front of the neck opening against the facing. We took this photo before the facing was cut and turned. If the hood is larger than the size of the opening, you will need to gather it slightly to fit. If it is not as wide as the neck opening you may need to gather the neck slightly or make the opening slightly larger. You want to be prepared before you sew the hood together. To sew the lined hood for your hoodie, put the right sides of both stitched hood sections against each other with the "right" fabric sides together. Stitch along the front edge of the hood, then turn it right side out through the bottom neck opening (see inset photos). Take the lined hood and center it on the neck opening. Sew the outer hood layer carefully to the neck edges from the center back to the front edge, catching the front facing into the seam as you sew. Trim the seam if necessary. You can either finish the hood now by sewing the neck edge of the hood lining over the neck seam to cover it (see step 14) or you can finish the hood when you have finished sewing the rest of the seams and hems. Once the hood is in place you can turn the doll hoodie inside out to stitch the underarm and side seams. A hand backstitch works well or you can use a sewing machine with a fine stitch if you prefer. Once the seams are sewn, the cuffs and the bottom of the hoodie can be hemmed, we used a rolled hem stitch again here. For larger dolls, you may want to use stitch witchery and iron the hems carefully in place. If you feel it is necessary you can apply a fabric glue or fray check to the seam edges to help prevent them from raveling. The final step in finishing the doll hoodie is to turn the bottom edge of the hood lining to the inside of the hood and hemstitch it over the neck seam to seal it in. We used a blind hemstitch to sew the folded lining edge to the neck seam edges. Make sure you also catch the top edges of the front facing when you sew the neck edge of the hood lining. If you wish, before you stitch the hood lining to the neck, you can stitch a narrow hem through both the lining and hood along the front edge and run a cord made from embroidery thread or other trim through as a pull cord. The cord will come out of the hood at the folded edge of the hood lining along the front neck edge. If you need to narrow the opening band to hold the hoodie on the doll, you can sew a small loop on one side of the upper neck opening and add a tiny polymer clay button as a closure. For very small dolls, elastic thread is easier to get on and off a button.